Who was Joseph of Nazareth, husband of Mary? What do we know about him, and how do we know? What gospel events does he appear in? Why did Matthew call Joseph ‘a just man’? What lessons can we learn from Joseph’s life? What do we know about Joseph of Nazareth? the careful man who taught a trade to Jesus, Son of God, who trusted and obeyed him. we are told what he ate, how he was dressed, many of the things he said, where and how he died. In the case of Joseph we know not a single one of these things. What we do know is some of the places where he lived, the things he saw, and a little of what he thought and felt. Most of our information about him comes from the ﬁrst two chapters of Matthew’s gospel and the ﬁrst two chapters of Luke’s. We do not know if Joseph was a native of Nazareth or not. His family, we are told, came originally from Bethlehem in the south, from the house of David. He is often portrayed as an older man, but in fact there is no reason to think this was so, except that an elderly man might be content for his wife to remain a virgin after marriage, as the Catholic Church taught. We have heard of Nazareth so often that it has become almost mythic, but the Nazareth where Joseph lived and worked was as real then as it is today. Take a map of Palestine and find the spot on the coast where Mount Carmel juts out into the sea on the south side of the Bay of Acre. Follow the River Kishon, on the north side of the Carmel range, upstream through the narrow gorge by which it enters the Plain of Acre, and you come out into the Plain of Esdraelon. This is the only break in the long line of hills which run like a backbone down the centre of the land, and the only level passage east and west, from the Jordan to the sea, for the whole length of Palestine. The Plain swarms with historical memories: of Elijah and the priests of Baal, of Gideon and the Midianites, of the tragic King Saul and the Philistines. This one spot has been the battleground of nations from the dawn of history, even down to the time of Napoleon – his comment was that no plain he had ever seen was more suitable for a large-scale battle! In shape the Plain of Esdraelon is a triangle, and the northern side, running east and west, is formed by the southern edge of the hills of Galilee, which drop sharply into the plain. About midway in the line of hills a narrow valley cuts in, rises steeply, and opens out into a high, flat basin. Here in this upland valley, 1160 feet above the sea, Nazareth lies. Nazareth was not an obscure, out-of-the- way-place. It is always called a town or city in the Gospels, and important trade routes passed nearby. The capital of the province, Sepphoris, was in sight from the hill above it. Flourishing cities on the coast and by the lake of Galilee were within a few hours’ journey. It lay in the midst of a beautiful and fertile country, with a teeming population and the hum of trade all about it. We must not picture Joseph and his little family as living in an isolated village. But Jesus, as we know, was born in Bethlehem, not Nazareth. You might look at The Birth of Jesus to see why this was so. There is no need to retell the well-known story of what happened when Joseph at length reached Bethlehem. The inn was full. The best they could get was a stable, a rough shelter for beasts. Meanwhile, in one of the valleys close by (Bethlehem lies on a hill) the shepherds heard the angels’ message, and were given the strange sign by which they were to recognise him who had been foretold as ‘wonderful cousellor, God the mighty’ (Isaiah 9:6) – an infant wrapped in swaddling bands and laid in a manger. Luke’s gospel tells us that Mary stored up in her heart all she saw and heard on that night. We can suppose that the same was true of Joseph. Eight days later he exercised the authority of a father: he circumcised the child, and gave him his name. When forty days had passed Mary and Joseph travelled the six miles northward to Jerusalem to carry out a twofold prescription of the law. The first-born male child of every Jewish family belonged to God, and had to be bought back with five shekels. On the same occasion the mother underwent legal purification and offered a lamb. Those who could not afford a lamb, however, offered two doves instead. Mary and Joseph came like other pious Jews to carry out what the law prescribed. We learn from this portion of the Gospel that Joseph was a poor man, for Mary made the offering of the poor. blessing God that he had lived to see with his own eyes him who was to be the Saviour of all peoples and and the glory of Israel. Then, while Mary and Joseph were filled with astonishment at his words, he turned to them and blessed them, as well he might; if he was so highly favored in seeing the Promised One, how blessed was the family into which this Promised One had been born! 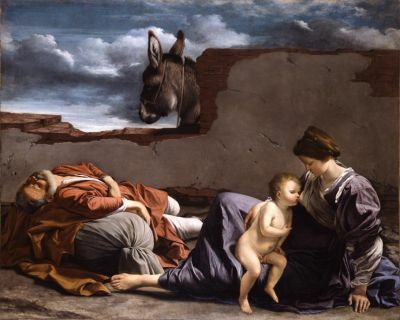 After the visit of the Magi, Joseph was warned in a dream to take the child and his mother and flee to Egypt, and stay there till he was told to return. Soon Herod would be seeking the child’s life. And so, while the Magi stole away eastward, avoiding Jerusalem, Joseph took the road to Egypt. He would have known there was a large Jewish community in the Nile Delta area. Once beyond the boundary of the Holy Land the little party was comparatively safe, and the rest of the journey could be made with less haste. Joseph would almost certainly have joined some small caravan for greater security. Travelling alone was dangerous. 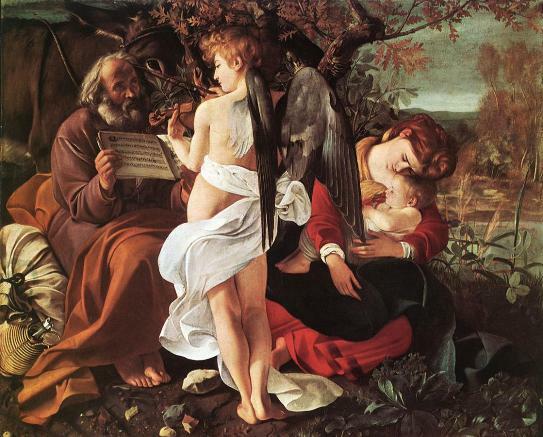 Joseph hears the voice on an angel in the music he listens to: Caravaggio’s symbol of a heavenly message. 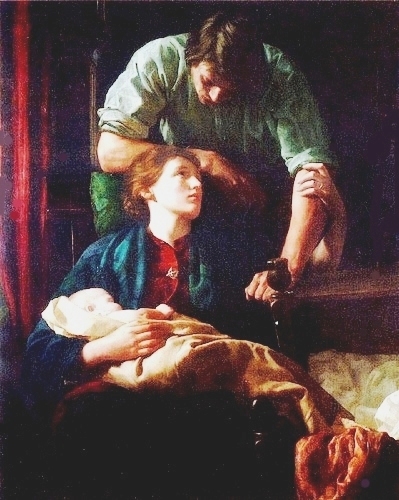 Mary and the baby Jesus fall into an exhausted sleep. As Joseph followed the desert route to Egypt and looked at the child asleep in his mother’s arms, he could not foresee an incident in that child’s later life when another storm would rage around him, and threaten to destroy him and his companions while he slept. On that occasion, with just a word, Jesus would quiet the stormy waters of the Lake of Galilee. Not now. Behind them the blood of the Innocents flowed and their mothers’ cries rose to heaven. It was left to Joseph to guide Mary and her child to safety. Note: We have only one ﬁxed date in the course of all these events, the death of Herod in 4 B.C. Then it was that Joseph was told to return to his own land. We do not know with certainty the year of Our Lord’s birth but the date most favored is 6 B.C. When Herod died, once again the angel spoke to Joseph in his sleep, and Joseph left Egypt, its temples and its pyramids, and set out for Palestine. 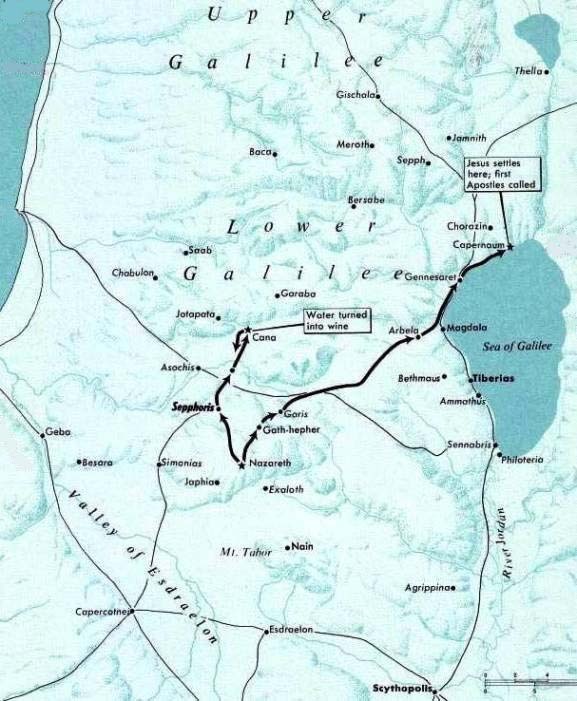 The journey from Egypt to Palestine and up along the coast to near Caesarea, the seat of Roman government, then across a pass in the Carmel range to Nazareth would be about 320 miles, a long distance to bring a boy of some two years old. It must have been with feelings of satisfaction that Mary and Joseph reached the familiar scenes of fertile Galilee and made their way up the steep road on its northern side which led into the pocket in the hills where Nazareth lay. The first is that he led the life of a carpenter/builder. The gospels are quite clear on this point. He was known and remembered by the people of the district as ‘Joseph the carpenter’. The word which we translate ‘carpenter’ may also mean ‘smith’ or ‘builder’, and it is likely that Joseph’s work was a mixture of both. Like all the ordinary people of Galilee, he would have the rough accent of that province, an accent which later betrayed Peter among the servants of the High Priest in Jerusalem. We learn from the Gospels that Joseph led a religious life. We are told that he went every year to Jerusalem at the solemn day of the Pasch. There were two other major yearly festivals, so Joseph may have gone to Jerusalem three times a year. We get confirmation of this in the seventh chapter of John’s gospel, where we find the ‘brethren’ of Jesus going up to Jerusalem for the feast of tabernacles. It was on one of these visits to Jerusalem that Jesus was ‘lost’: ‘When he was twelve years old . 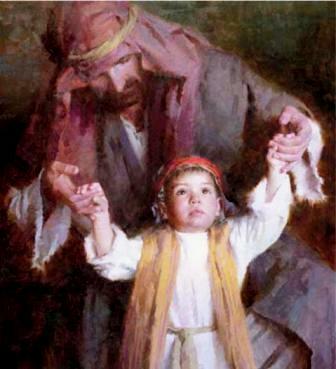 . . the child Jesus remained in Jerusalem‘. But by the age of twelve, now officially a man, Jesus was already familiar with the city, and in the opinion of those around him, remarkable for his wisdom (Luke 2-40). So it was not a case of Jesus being ‘lost’ as we commonly understand the word. Luke’s gospel puts the matter quite plainly when he says simply that Jesus remained behind in Jerusalem without letting his parents know. Joseph would have felt no anxiety when he did not see Jesus in the course of the first stage of the journey, until he failed to rejoin them at night. Then he and Mary, and no doubt all of their relatives, became alarmed, enquired fruitlessly among their friends, hurried back to the city, searched all next day without success, and finally found him on the third day among the rabbis in the Temple. It must have been a sore trial for Joseph. Besides his own grief and anxiety he had to witness the anguish of the boy’s mother. She in turn was conscious of Joseph’s grief: ‘Your father and I have sought you sorrowing’. 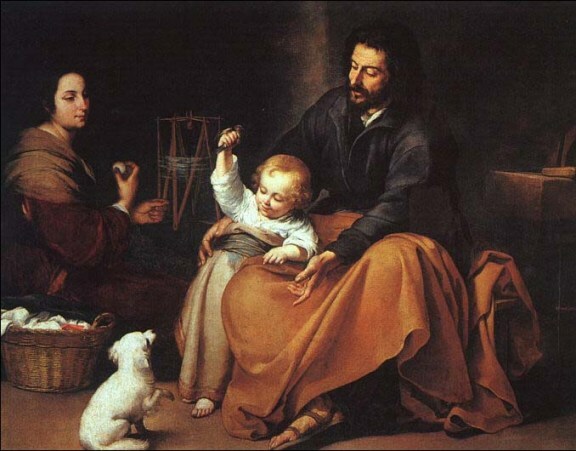 The third fact which we learn from the Gospels about this period of Joseph’s life is that he exercised the rights and duties of a father in regard to Jesus. Jesus was known afterwards and commonly referred to as the son of Joseph. For Mary’s spontaneous use of the word when she came upon her Son in the Temple, we see that ‘father’ was the name Joseph ordinarily went by in the home at Nazareth. 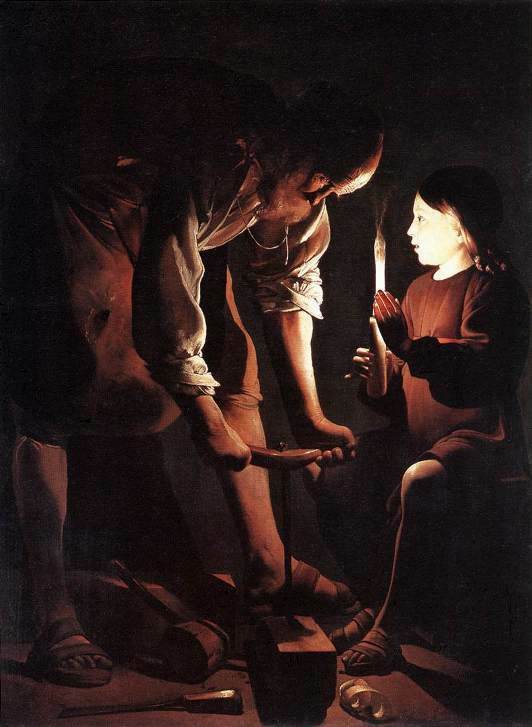 Joseph carried out the duties of a father:he instructed his son in the precepts of the Mosaic law; he taught him the inspired stories of the Old Testament; as the boy grew up and became strong, he taught him his own trade. Jesus must have spent at least half his life in Joseph’s house, and his thought and speech as revealed to us in the gospels reﬂect the experiences of all those years. Exactly how long Joseph lived after the last mention of him in the Gospels, when Jesus was twelve years old, is unknown. He seems to have died some time before the beginning of Jesus’ public life. In several places later in the Gospels, where we should reasonably expect some reference to Joseph, we find none. Thus, when Jesus visited Nazareth the people said ‘Is not this the carpenter, the son of Mary?’ and then follows a reference to his brothers and sisters who were living among them; but not a word of Joseph. And finally, on the cross Jesus left his mother to the care of John. The only direct testimony we have in the Gospel about the sort of man Joseph was is that ‘Joseph her husband was a just man‘. They are few words, but full of meaning. There is a great difference between a man who performs just actions and a just man — as there can be a great difference between a person who does charitable things and a charitable person, a person who does humble actions and a humble person. A just man is one who serves God and keeps his law. What lessons can we learn from Joseph? Joseph’s life was a humdrum one, accompanied by sorrow, hardship, disappointment, and monotonous work. There was very little glamour in Nazareth. We get a picture of a silent man who carried out God’s will through obedience, amid trials, by faith, in obscurity. We are told nothing about his private life or thoughts, no personal details about his birth, upbringing, or death. He was not exempt from sorrow and suffering. The very first incident related of him in the Gospel shows him faced with a terrible perplexity which must almost have torn his heart in two. And the last scene in which he appears shows him wandering about Jerusalem in bitter sorrow. Joseph’s were the trials that anybody has to suffer at one time or another. Why should we complain? Joseph did God’s will, he carried out the work that lay to his hand, but he did not always understand God’s plans. Is it right that we expect always to understand them? What can Joseph teach us? We can learn from him that neither money nor position nor talents nor special opportunities are needed if we wish to serve God with the greatest perfection. It is a delusion if we think that we could be saints if we were somewhere else, or had some other employment, or a different family. We may learn that true goodness does not consist in pious sentiments or even in lofty meditations, but in faithfully doing God’s will, day in day out, in the world in which He has placed us. This is the practical, solid spirituality we find in Joseph’s life. May that life be an inspiration, help, and encouragement to us, and may we follow the same path as courageously and as faithfully as he did.